Orange County has been getting a ton of rain lately, which means major snow in our mountains! I was so excited to find this coat for our trip up to Big Bear. It has all the snow bunny feels. I figured because it was white, it would probably be a little hard to photograph against the snow, but sometimes you just gotta pack for yourself and not the blog. Anyone else feel me on this struggle? First of all cutest snow bunny ever! Adore the crisp white and pretty pink boots! Second of all…your electric bike sounds sooooo cool! And gotta have the basket and bell! I think you should do a photo shoot with the bike, lol. Enjoy a fabulous weekend of sunshine you precious lady!! I have a very similar jacket and I love it! It just makes me feel like such a snow bunny! I love it with your pink hunter’s!! How fun is your bike!! I love that it has a basket and bell!! lol that bike sounds fantastic and the pictures are beautiful-you packed well! This coat is so cute and cozy! Love the fur trim! This coat really does have all the snow bunny feels, it’s so cute! And I love how you paired it with the bright pink boots and lipstick and those bright sunglasses! Enjoy you long weekend and have fun with the electric bike! Snow bunny indeed! What a perfect coat for Big Bear! 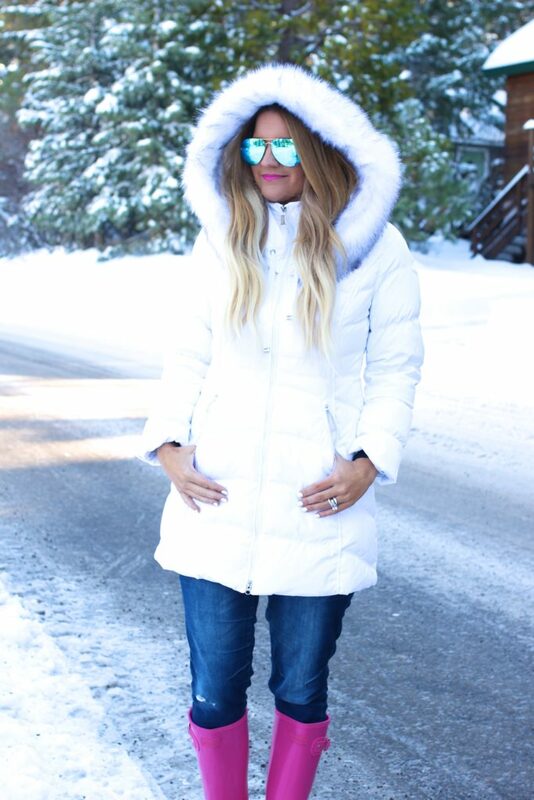 The white coat, pink boots, and mirrored sunnies are just pure perfection Shauna! You look simply adorable! I love the coat, the white furry collar is so cute! i totally dress for myself and not the blog! the white looks great on you! love the brights in the winter time! You do look like an adorable white snow bunny in that coat! I also love the pop of pink from the boots! I have been seeing so many long puffer coats this winter, I need to get my hands on one! I love white jackets in the winter! Those white coat and pink boots looks really cute together! Always adorable in the snow! Love those hot pink boots lady! You are the cutest snow bunny! Love your pink boots, and that bike sounds amazing. Those bright pink boots are adorable!! I love the coat and the boots are so cute. So in love with your snow bunny look! The white coat is so chic and the pink boots are the perfect contrast. You look so cute in this white parka with the pink boots and lipstick. The pictures are so sweet! It is hard to photograph in snow no matter what you’re wearing, I think. I struggle with winter photography living in the north. Ohhhh I am obsessed with your cute pink boots! Such a great snow look! Those sunglasses though! You look great! Even thought the white jacket is a little tough against the snow it looks awesome on with the pink lipstick and boots. You’re rocking it!! You are seriously the cutest, and I love the pink boots! I’ve never heard of an electric bike, but now I’m thinking that I need one!! Perfection!! I love those boots! Wow, your coat looks so fuzzy and comfy! Your whole look is just so crisp and clean, I love it! I hope someday, I could also spend my holiday in a snowy area. I hope you are enjoying the weekend (and your bike)! Gorgeous snow bunny! Love your bright pink lip color and boots! I so feel the struggle, gurlll. Its not easy especially with this weather. Your coat is HOT and I need it in my life. Ha! You look so gorgeous girlie, that coat is so cute! Such an adorable coat! It looks great with your jeans and bright pink boots. Thanks for linking up with Fabulous Friday, Shauna!